At airports, banks of seats with built-in power plugs are no longer an uncommon sight. But if you’re lucky enough to nab a powered seat, odds are there’s no place to set down your coffee or put down your gadgets. Furniture designers and airports are working to address that problem and one helpful solution might be “Place” seating from Arconas, which has power and USB plugs under each armrest, drink holders, and a tablet arm that can be used to put down gadgets, food or both. Denver International Airport recently installed 800 “Place” seating units in the new Southwest Concourse C.
Gadget glitch at ORD Airport? The Geek Squad is there. Pretty much everyone travels with an electronic gadget -or three – these days, and sometimes those gadgets get finicky. If that’s what’s happening when you’re at Chicago O’Hare International Airport from now through December 23rd, there’s free help at the ready. Best Buy Geek Squad Agents are stationed in O’Hare’s Concourse H from 8 a.m. to 5 p.m. CST daily offering free tech tips and gadget advice, complimentary service on handheld devices, charging stations and tablets and desktop workstations for surfing the web, playing games or shopping for last-minute gifts. Not near Concourse H? Don’t fret. The Geek Squad is sending agents out into the terminals will backpack charging stations and advice. Got a gadget glitch at the ORD Shoe Hospital, the airport’s aeroponic garden or while waiting for your meal at Tortas Frontera? Tweet to @GeekSquad with #MissionORD in the message and they’ll come to you. Santa, strolling carolers, free gift wrapping and a host of other holiday-themed entertainment is popping up at airports this season. But at Huntsville International Airport Santa’s little helper “Airlene,” has been showing up to make sure holiday travelers take note of all the new charging stations that have been installed throughout the airport. So watch where you sit! Have some extra time to spend in the United Airlines portion of Terminal B at Boston Logan International Airport before your flight? Except for the oatmeal that I had to send back – twice – at one of the sit-down restaurants by the gates, I spotted these charming – and useful – amenities. Fresh flowers! And blue counters color-coordinated with the powerful Dyson hand-dryer in the women’s loo. When I came back two days later, the flowers were changed out for a fresher bunch. 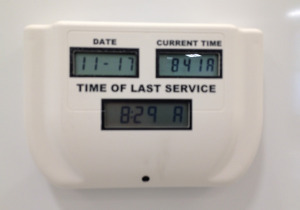 Go with confidence: a hard-to-miss timer in the women’s restroom showed the correct date and time and the time when the area was last serviced. Living room or gate hold area? Everyone one of these comfortable chairs had a table and power. Stuck at the airport? Inflate an office. An inflatable office that could be used when out on the road. 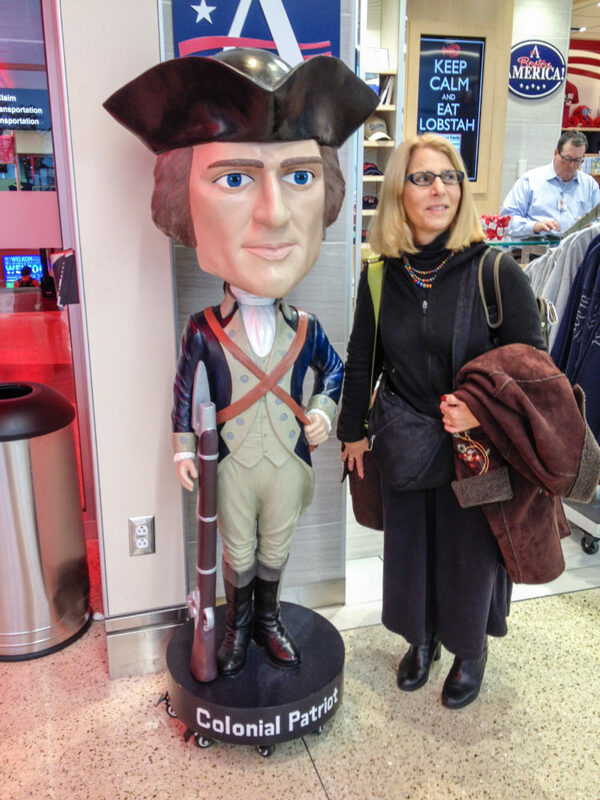 Here’s a fun photo that shows him at work during a stop-over at an airport.